BMCE Bank of Africa has signed a partnership agreement with China-Africa Business Council to support and facilitate the task of Chinese investors in Morocco and more broadly throughout Africa. The agreement was initialed on the sidelines of the just concluded China-Africa Summit held in Beijing (September 3-4) and the China-Africa Cooperation Forum in the private sector held in Hangzhou Thursday (Sept. 6). This partnership, which aims to be strategic and sustainable between the two parties, “also aims to streamline and simplify foreign trade operations between China and Africa by making Chinese operators benefit from the African expertise of BMCE Bank of Africa,” said the bank in a statement. The banking group, which has recently opened a new branch in Shanghai, said Chinese operators will also benefit from “the added value brought by the Shanghai branch”. 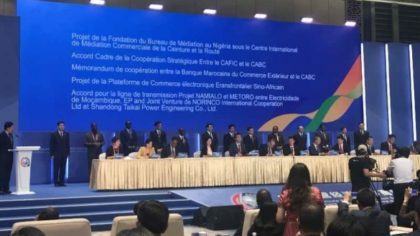 The agreement was signed on the Moroccan side by Said Adren, Managing Director of BMCE Bank of Africa Shanghai, and on the Chinese side by Wang Guidong, Vice President of the China Africa Business Council.